In most productions, the lovers look about the same age. Here, he looks much older than her. Workman’s Juliet is very young. Not just in her looks and size (when she kisses Romeo or hugs her Nurse, she has to stand tiptoe), but in her glances and her movements. Bouncy, sometimes bratty, and a bit klutzy, she is unmistakably a child. She even sits on her Nurse’s lap, even though she doesn’t quite fit there anymore. She is just sticking her toes in the waters of adulthood, innocent of sharks and rip tides. This production is full of foreboding. In her first encounter with Romeo, he approaches her from behind and his shadow falls over her face. She lights up as he touches her arm, but she’s also scared. As they trade their first flirty lines about saint’s hands and holy palmers, she doesn’t look at him, but at us. In a way, this is an awkward setup, and Workman’s delivery was more stilted here than elsewhere. But it was not bad acting. It was a teenaged girl playing out, for the first time, a scene that until then she had only read about in books ("You kiss by th’book," she tells him). She is trying to be older than she is, and she is, like Romeo, in love with being in love. With all of this, it is not surprising that she instantly decides that this very troubled young man is her be-all and end-all. 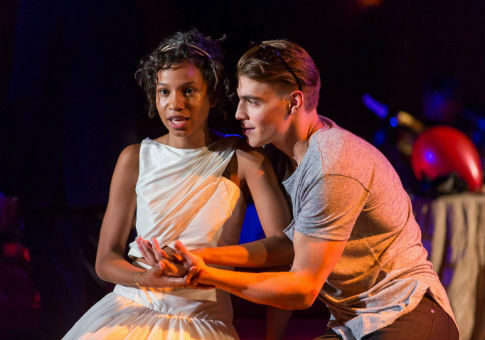 Do not get me wrong: Veenstra’s Romeo is not sinister or particularly bad willed. But he is irresponsible, selfish, and reckless. Nowhere is this better illustrated than in his duel with Tybalt. Usually Romeo stabs him, almost by accident. Paul has Romeo savagely beat him to death, the blood spraying his face and neck. This violence is the volatile and uncontrollable underside of his love for Juliet. Maybe Romeo would be better if he didn’t have such rotten friends. Jeffery Carlson’s sour, mullet-ed Mercutio is thoroughly charmless (in his very ugly silvery suit). If nobody is laughing during the Queen Mab speech, you are doing it wrong. The biggest misstep in this Romeo & Juliet, however, is the scenery. The entire action of the play takes place indoors, in what looks like the lobby of a stately hotel or apartment building. What, then, is the feud? Are the Montagues and Capulets dueling tenants? Have the Capulets been putting over-sized objects in the trash chute again? Even the balcony scene takes place indoors. Romeo swears not by the inconstant moon, but by a deflated red balloon he finds on the floor. Even the Church fails to help. Friar Laurence allows Romeo and Juliet to marry in secret, with no witnesses. Because the city has not legalized the match, Juliet has no recourse to refuse when her parents want her to marry someone else. The Friar does not suggest that the couple appeal to the Prince for protection. Instead, he suggests subterfuge, which is their doom. There is no public, civic life to mediate the private passions of the citizens. Confined as it is to the hotel lobby, the action of this Romeo & Juliet cannot point us to such reflections. But perhaps it can serve to emphasize the sense of suffocation and isolation that the young people of Verona must feel, trapped in their homes. The set, painted a deep, rich red and divided into four quadrants (two balconies and a room split by an elevator shaft), could even suggest the atria and ventricles of the heart. This is backed up by the score, trancey-techno music underscored by a persistent bass that throbs like a pulse. Romeo & Juliet teaches us that throbbing hearts aren’t enough—that lovers need institutions and laws in order for their unions to flourish. Abandoned to their passions and the whims of fortune, of course the lovers are doomed. 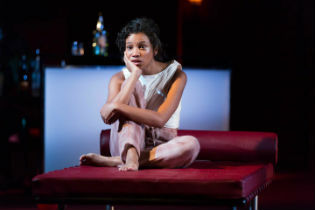 Romeo may be a wastrel and Juliet may be naïve, but they lack the structures (and the time) necessary to grow up into better, more mature human beings. Especially in Juliet, there is so much lost potential. Every time I watch this show I wish it could end some other way.